Marvel took everyone by surprise when it unveiled the first full-length trailer of the upcoming superhero movie, Captain Marvel. Marvel took everyone by surprise when it unveiled the first full-length trailer of the upcoming superhero movie, Captain Marvel. Featuring Brie Larson in the titular role, it is being speculated that this superhero will reportedly save Avengers from the wrath of Thanos in the upcoming Avengers 4. 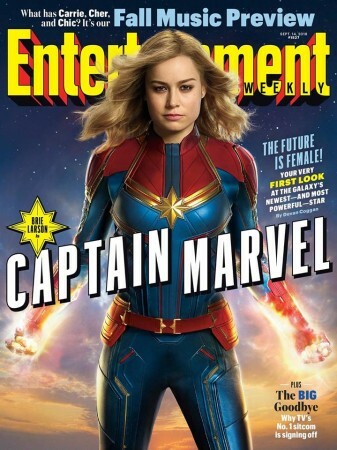 Captain Marvel follows the story of Carol Danvers, a pilot who receives some superpowers and goes on to become an elite soldier — just like Steve Rogers. But unlike Rogers, Danvers becomes a part of a military team in the space. However, her life takes a turn when she returns back to the planet Earth. The trailer starts with Captain Marvel falling to Earth and landing inside a Blockbuster Video shop. The video shop shows that the story is taking place somewhere in the '90s. She later finds herself in the Los Angeles subway system. The trailer then jumps to showing Danvers as a SHIELD member — decades before it was infiltrated by Hydra. Nick Fury also seems to be the narrator of the entire trailer. The good old Nick is trying to help Carol in finding a way that can actually make sense to her. In the trailer, there's a quick scene of Carol walking alongside the other members of Starforce. In the movie, several members of Starforce will make an appearance, that includes Mar-Vell. The trailer shows Jude Law playing Mar-Vell -- the captain of the Kree militia, who later dies of cancer. In addition to all this, moviegoers were quick to spot a cat at the bottom left of the movie poster. The cat is not a regular home-based kitty which we are accustomed to seeing on Earth. As per the Marvel Comics, the cat is actually an alien species called Flerken. In the story, Danvers is not aware of the cat's true identity but ironically names her, Chewie, after Star Wars' Chewbacca. Along with Larson, the film will feature a two-eyed, digitally de-aged Samuel L. Jackson playing Nick Fury, Judy Law as a Kree commander, Lee Pace as Ronan the Accuser, Ben Mendelsohn as Talos, and Gemma Chan as Minn-Rrrva. Directed by Anna Boden and Ryan Fleck, Captain Marvel is slated to release worldwide on Women's Day 2019.